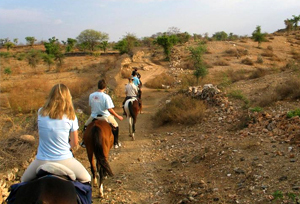 Riding on a horseback in India is an incredible experience for the tourists. Indian topography, especially the sterile and spellbinding terrain of Rajasthan tenders offers the exhilarating horseback riding along with catering the exotic charm and hued pageantry that leaves every tourist amazed. The horses used for the ride are Marwari. These horses are vibrant species that were great war horses in bygone era. In modern era, these horses make awesome companion for the tourists in safari. This Trail Riding in Shekhawati on Marwari Horses offers memorable ride in the midst of breathtaking extravaganza of the nature. With this all-inclusive 11-day itinerary, you will bag some of the most elating moments of your life that will remain etched in your mind forever. On arrival in Delhi, our representative will be there to meet you followed by transfer to the hotel for an Overnight stay. After breakfast at the hotel, we will drive to Nawalgarh. Enjoy a royal welcome on arrival at the Roop Niwas Kothi, which lies just a kilometre away from the town and have a fascinating blend of European and Rajput style of architecture. The Palace has a lovely, spacious lawn, a billiard room and a swimming pool. After lunch, we will be taking you to the stables where you will be introduced to the team for the safari. It will be followed by a briefing on Horse riding in India. Later, we will introduce you to your horse and let you know how to ride them. 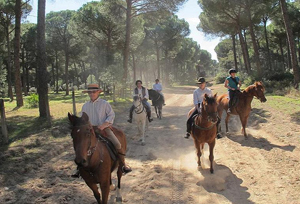 You can then ride around the field tracks near the palace to get accustomed to your horses. In case you are not comfortable with your horse, then you can try another horse there and then. 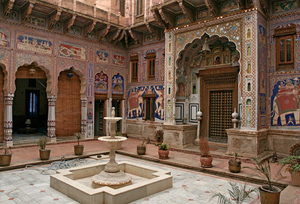 Nawalgarh in the Shekhawati region in Rajasthan's districts of Jhunjhunu & Sikar, known for painting houses or "Havelis" of its wealthy merchant class, the Marwaris. This region could be called the open-air art gallery of Rajasthan. The drive to Shekhawati is through picturesque village and farms. Founded in 1737 AD. by Thakur Nawal Singh, a warrior statesman, whose name is enshrined in history and folklore. The town exudes an old world charm and the colourful bazaar has the largest number of painted Havelis in Shekhawati. An overnight stay at the hotel. In the morning, we will ride out with picnic breakfast to the countryside and return at the time of lunch. Afternoon is free to explore the palace and enjoy participating in various activities or you can go for the sightseeing of Nawalgarh by car with guide visiting havelis, to see frescos and painted houses. An overnight stay at the hotel. Today in the morning, we will ride around Nawalgarh. During the ride, we will visit farmhouses and village homes of people who keep local horse breed the Marwari horses. We will further visit the stables and interact with the farmers. En route, we will have our picnic lunch. In the afternoon, you can talk by on Marwari horses followed by interactive discussion on how to encourage local horse lovers to continue to keep Marwari horses and beliefs of Indian people about horses. In the evening, enjoy traditional folk entertainment and dinner followed by an overnight stay at the hotel. Today we will start our day with a ride through semi desert areas with small farms and countryside dotted with Khejri trees. En route, we will enjoy picnic lunch. Further, we will ride through semi desert farm countryside to reach a small woodlot and dry waterhole, surrounded by KER bushes many flocks of blue bull antelopes may be seen around campsite. An overnight stay at the Camp. In the morning, we will ride through semi desert region and Fatehpur Beed with picnic lunch, which we will be enjoying near a typical Shekhawati architecture water tank "Jodha". The Nawab of Fatehpur 300 years ago has encircled an area riding on a horse from sunrise to sunset and declared it protected. Today, Fatehpur Beed is an amazing 70 sq km area with all species of desert plants. While camping in Beed you can get a chance to see Desert Fox, Jackal / Blue Bull and Deer. The protected area proves that if human don't inter-fear a semi forest can be created in a desert. An overnight stay the Camp near a ruined traveller's home overlooking the entire Beed. This is a most beautiful campsite. Today, we will be riding in the North. We will further go into the Shekhawati region. The sand dunes are dotted with greenery where farmers have found water from deep tube wells. 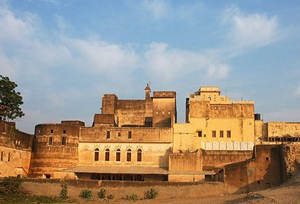 Ramgarh is a town with many painted Havelis, an interesting traditional market place. An overnight stay at the camp in a farmer's field. Today, you will pass through very high sand dunes and desert villages, to reach the beautiful small village of Mahansar of shekhawati region. The hotel is a charming family run hotel with basic comforts but very tasty home cooked food. In case the accommodation is not available in the hotel, then we will set a camp at Mahansar, and would go for a meal with the family at the Castle. An overnight stay in Mahansar Castle / Camp. Today, we will ride out with picnic lunch. Later in the afternoon, we will go for sightseeing of Mahansar. We will be visiting the Gopinath temple and the famous 'Sone Chandi Ki Haveli'. An overnight stay in Mahansar Castle / Camp. Today, start your day with an early morning ride around and say goodbye to your horses. After breakfast, we will drive back to Delhi. On arrival in Delhi, check-in at the hotel for an overnight stay. After breakfast at the hotel, we wil transfer you to the international airport to connect the flight for onward destination.